Looking for the best in professional-grade Cumberland Power Washing service but not sure where to begin? Let us tell you a little about what we do and how we became the top choice in the area for this kind of exterior cleaning service. At A to Z Softwash we take great pride in the pressure washing work we do and it shows in the final results we get. You can’t earn the level trust with customers that we have without doing something very right. We have been helping homeowners in Cumberland with their exterior cleaning service since 2012. Let our Cape Cod roof cleaning and power washing experts help you get your property cleaned up for the season. You'll have long-lasting results that make you proud of your home. We are probably right in guessing that it has been a while since the last time you had the exterior of your home cleaned by a professional Powerwashing contractor. There’s actually a good chance you have never actually taken care of this. While this is a common circumstance, it can come with dire consequences. Not only will the exterior of your home look poor, it could be at risk from invasive contaminants like mold and algae. Now that you are aware of this, it is time to do something about it. Call our experts today. One of the most important tasks you need to take care of as a homeowner is keeping it clean. And probably the most crucial area of concern is the rooftop. If you want to avoid problems like roof-rot or sagging, then you have to take care of removing contaminants like mold and algae. This means making sure it is clean and stays clean to prevent these types of problems. Don’t make the mistake of assuming this would be a good do-it-yourself kind of project. The equipment you can rent from your local home improvement store is not the same as what we use. If you want to completely rid your home of algae, mold, dirt and other harmful substances, give the A to Z Softwash team a call. 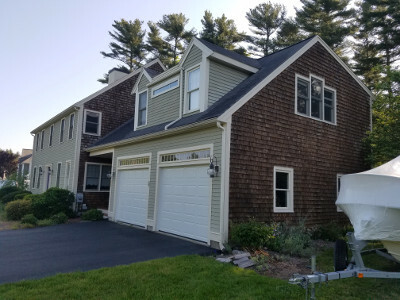 If you are looking for a Cumberland, RI roof cleaning and exterior softwashing service, then please call 508-209-7795 or complete our online request form.